In a tower, in a prosperous trade city, an archmage desires a guardian and an assistant. Familiars are useful but fragile things. He knows of golems but they are unintelligent, inflexible things. He wants a finer creation. He studies, researches, and experiments. He crafts a better golem body – strong and dexterous – and armors it with finely forged steel. Finally, he begins the invocations to animate the construct – but he goes a step further and imbues it with the tiniest shred of his own soul to give it life. “If this works I will create more,” the mage swears quietly to himself as he waits. The construct’s eyes flicker to life, and it moves. Limbs bend and twist. Its legs fold and shift. Turning, it rises to its feet and stands over the mage, looking down at him with glowing blue fire in its eyes. “What is your name?” the mage asks keenly, waiting to hear how this new creation responds without any other prompting. The construct’s eyes flicker with surprise and it considers this question. Finally, it answers. As D&D Next continues to ramp up, I’m reminded of what happens when two editions collide in the context of a home campaign. Specifically, how we as DMs deal with the change of materials and how it affects the canon of our homebrew settings. Thinking about the changes from 4th Edition to D&D Next reminded me how a new element joined my campaign while another element gracefully bowed out during the edition transition from 3rd Edition to 4th. I began my homebrew setting, Solista, in early D&D 3rd Edition, easily transitioned into 3.5 Edition, and finally transferred happily into 4th Edition. Most new 4e races fit right into my world, or else had very easy explanations to squeeze them in with the rest. Genasi? No problem. Tieflings? No problem. Changlings? No problem. Warforged No prob- w-wait, what!? Warforged seemed pretty cool to me as a player and as a DM. I never thought of them like robots, instead I had mythological Galatea-living-statue type inspirations. Regardless, warforged simply hadn’t existed in my setting previously. I didn’t want to ban the race, so I embraced their existence in my setting. I added them to a city the players had never visited, and established their numbers were few, but enough that my players could choose to play one. In 3.5 Edition I had crafted, playtested, and perfected to my personal satisfaction, a custom homebrew race. They held an important place in my world’s history and lore. Unfortunately, 4th Edition had no room for them – mechanically they just didn’t work out at all. After much playtesting and pulling of my hair, I eventually accepted the fact they would not be a good fit for 4th Edition rules. While I could just change them to monster stats, it didn’t feel right. So I embraced another change and took things to their next logical conclusion: the homebrew race had to go. Over the course of a few plot arcs, I established that the race, called gryfalkyrie, packed up and moved out without so much as an explanation or a farewell. They left behind their cities and their villages. I used this to spark controversy and war. Kingdoms that conflicted with the gryfalkyrie now surged in to claim their lands. They disputed over new borders, treasure hunters looted the empty cities, and preservationists protested potential destruction of the nearby natural wilderness. A new organized was formed to protect the forests – the Wardens – which became a basis for an entire campaign in of itself. This and so many other things evolved from my setting just from dropping a single homebrew race. D&D Next may or may not bring new things to my campaign setting, but it may very well remove some things. I don’t need to make that a bad thing though – it can mold and shape a new age in my campaign, which is good. Nothing should stay the same way for too long. I’ve always liked exploding critical rules. Additionally, in 3.5 D&D I often played with a triple critical rule where three natural 20s meant you automatically killed the target. Admittedly when I was a player I loved this rule but as a DM it often threw wrenches into my gears (one of my players was nicknamed “Dice Jesus” for a reason)! Exploding Critical – On a critical hit, roll again. If that roll is a critical hit add one bonus die of damage to your total number of bonus dice. If your weapon or implement doesn’t have bonus crit dice, add 1d6. Repeat until you do not role a critical hit. Who doesn’t love to roll more dice? Who doesn’t love the thrill of crazy good luck? Really this rule will most often only add a dice or two to the bonus critical dice they’re already rolling for their magic weapon/implement without heavily swaying the game. It just gives that satisfying extra “umph”. Note that it requires a critical hit, so if they have crit enhancements – like critcal hits on a 19 – then this still triggers. If you have a player that crits low, then next houserule might be a better choice for your table. Maximized Critical – On a natural 20, roll again. 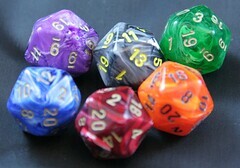 If that roll is also a natural 20, in addition to your regularly maximized damge, do not roll your bonus dice. Instead they are also calculated as if you had rolled max damage. This is a more controlled, if slightly hefty approach. It requires a natural 20, not merely a critical hit. It maximizes the bonus dice, but doesn’t add more dice. Easy for the DM to anticipate because the DM doesn’t actually need to raise their damage expectations. A player could roll max damage on their bonus dice by pure chance – so getting to maximize occasionally it should not shake your numbers too badly. I would use this for games that tend to have deadlier enemies for combats with more punch. Who Even Still Reads Blogs?